You can check out the latest Carnival of Personal Finance (#298 – The Best Money Articles Online) here. I didn’t expect that one of my most argued series of posts would be about dividends; I thought it would be around my vehemently anti-anti-debt stance (see if you can work THAT out). I see where you are coming from and disagree to a point. It depends on what your outlook is. 7 mil in 7 years of course dividends aren’t going to get you their. But my grandfather who was a coal miner who cannot work into his 70s because of the type of job. He was able to be a dividend millionaire. When he did retire the income from dividends, his pension and social security was more than enough for him to live comfortable into his 90s and leave money for his children. At 90 years old he isn’t going to work,build a business or mess around with real estate. He wanted to check he dividend paying stocks once a month and enjoy retirement, drink a few beers and his biggest worry was cutting the grass. I also find it interesting you mention Berkshire Hathaway. Depending on when you look at BRK holdings they do invest a significant amount of money into dividend paying stocks even though they do not themselves pay a dividend. 1. Yes, this blog is specifically aimed at those who want to make what I call a Large Number / Soon Date (eg $7m7y or $2m5y, etc. ); however, in this case, I don’t think it makes any difference: investing in stocks just because they happen to produce dividends is dumb. In my businesses, I am free to create a dividend whether the business is performing well or otherwise. So can the boards of public companies. If that simple point doesn’t win the pro-dividend lobby over, nothing will. 2. It seems like Deek’s grandfather did an amazing job! Investing in a bunch of “dividend stocks” – and, holding for long periods – is certainly a lot better than many other strategies, certainly for non-$7m7y’ers. But, he may – probably (certainly!) – have done even better by following a Value Investing approach (e.g. such as that proposed by Rule # 1 Investing author, Phil Town). Buying and holding great stocks – ones that produce a steadily growing profit stream – is an even better way to make long-term money than buying and holding stocks just because they happen to pay a steady dividend stream. The two should be synonymous, sadly that’s not always the case. 3. I’m not suggesting that you (or Deek’s grandfather) should invest in business or real-estate etc. Although, I strongly argue that in retirement RE, in particular, provides a much more secure retirement, again for $7m7y’ers. Like Warren Buffett, I am not against investing in stocks that pay a dividend; I am simply for investing in great businesses – or, the stocks of great businesses – regardless of whether or not they pay a dividend. If you caught my podcast (Jaime from Eventual Millionaire interviewed me here) then you will know that I am obsessed with business … after all, it’s how I made my second $7m7y! But, my hobby (lucrative or expensive, as fate and fortune may rule) is to work on startups; I am already ‘angel funding’ a few … this series is the story of one of them. If you’re buying or starting a business, the first thing you absolutely MUST be able to do is put your ‘reason for being’ into a sentence or two. This is commonly called your ‘elevator pitch’ because you should be able to use it to tell a stranger what you do in between getting on and getting off an elevator! But, it’s use is far more important than that … it’s to help you make sure that you really have something unique. If you don’t have anything unique in your offering, you will be struggling to sell it to your customers let alone to the people who will one day (you hope) want to buy your business! Note: I found this tool a long time ago, but can’t remember the source; if I could, I would share the link here. Until then, use it well. The example provided is from a real business that I looked at starting, and the USP is the real one that we came up with using this tool. 1. Download the Automatic USP Generator and answer the questions in the right hand column as best you can. 2. Use those answers to “fill in the blanks” in the two sentences just below the question/answer box. 3. Rewrite in plain english – you may need to fiddle a little with both your answers and the sentences that you come up with to make them read well. Remember: you are trying to come up with something unique! This tool will take you 90% of the way there, the other 10% is iteration until somebody that you trust, but who knows nothing about your business concept, says “wow”. Why don’t you share your elevator pitch – it can be for your business, your startup, or just for an idea you are working on – with our readers (in the comments section below)? I’ll send the best one $100 by PayPal towards your own startup idea. No strings attached! Jaime from Eventual Millionaire interviewed me. Check out the interview (you can even download the podcast) here! Regarding the first tip, I”m assuming you are referring to not using more than 20% of your net worth as a down payment, correct? Because as time goes by, your equity should grow, and it wouldn’t make sense for most people to withdraw equity from their home value. My overarching rule of thumb is to always have 75% of your net worth in investments. Since you can only buy a shoebox (literally) for 20% of Net Worth, if you’re a typical person just entering the workforce … don’t sweat it: just apply these rules AFTER you have bought your first house/car/TV/etc. Dividends: real cashflow or fake cashflow? The second is that I’m posting more business-related posts (e.g. my Anatomy Of A Startup occasional series) … I am funding a series of startups with the ultimate aim of a Y-Combinator style of early stage entrepreneurship mentoring / funding program and what I am sharing in this series is real ‘special sauce’ stuff … like everything that I do, it’s usually simple but works! Back to the first change: if I write less frequently, I’m hoping to challenge myself and my readers even more. To whit, my last post (inspired by Canadian Couch Potato’s brilliant post on the same subject) inspired a one week long comment-debate … one of the best that I have seen on this blog. The main thrust was the debate around income v capital growth. The reasons why people desire rental income from real estate are the same reasons why people desire dividends from stocks…you get a cash flow without having to sell the asset at an inopportune time. 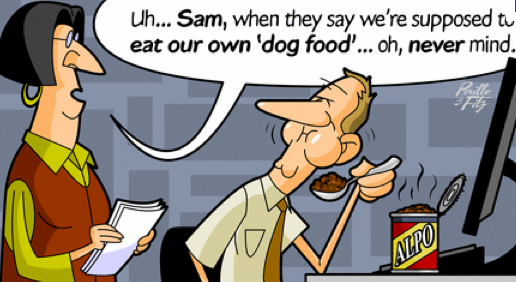 But, there’s a key difference between so-called ‘Income Real-Estate’ and its stock market equivalent – Dividend Stocks: Income RE produces REAL cashflow, Dividend Stocks produce FAKE cashflow! Tenants pay rent; you pay costs; what’s left (if any) is real, spendable, excess income/cashflow that generally increases with inflation. Bad RE doesn’t produce an income. Period. 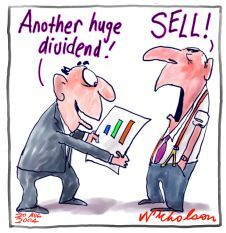 Dividend-paying company sells stuff; they pay their suppliers and other costs; Good company produces profits / Bad company produces losses. In either case, the Board meets and says “we gotta pay some dividends”. Do you want your board fussing over distributing cash that it may or may not be able to spare? Or, would you rather that your Board focussed on building a GREAT company, with GREAT long-term growth and profitability prospects? 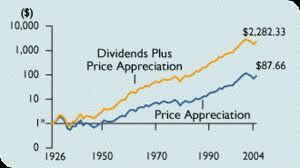 The pro-dividend guys do have a compelling case that dividends grow more smoothly than the ups/downs of the markets. As we have already seen, the apparent ‘smoothness’ of the dividend stream can be illusory. 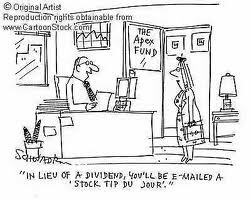 And, what are you going to do with any dividends that you have received pre-retirement? I presume that you are going to reinvest them so that you, too, can get to $7 Million in 7 Years (or, at least to your own relatively large Number by your own relatively soon Date). In other words, you’ll just take that relatively nice, smooth dividend stream and throw it right back into the choppy market [AJC: Next, you’ll be telling me that you’re Dollar Cost Averaging … somebody, grab me a Tylenol, please!]. If you’re going to be fully invested in the stock market, for a number of years, then why don’t you at least buy some stocks in great companies that are going to grow, grow, grow … profits?! If they happen to pay dividends, well great [AJC: you’re going to give it straight back to them, anyway, aren’t you? ], and if they don’t, well who cares? I mean, would you rather own “this dividend stock [that] has delivered an annualized total return of 3.10% to its loyal shareholders”? Or, would you rather own this never-ever-paid-a-dividend stock that has delivered an annualized total return of 20+% to its loyal shareholders for over 40 years?! I was stuck in an internal conflict about paying off debt or investing for years until now. I would like to apply your debt cascade to my financial situation and need your help. You’ll have to take a quick look at my original post for the details, but the jury was pretty much split over whether Bristol could (or should) pay off his debts now or later (for the purposes of investing instead). I would invest it all and not make any early debt repayments. Five percent (the most expensive debt – assuming it is not tax deductable) is a pretty low threshold rate of return to beat and mortgages and student loans are unlikely to be called early unless you miss a payment. The first is that, while average returns are much better than the interest rates being earned (actually saved … but a dollar saved is a dollar earned right? ), if Bristol also applies his $10k cash stash to the debt, it may take him <2 years to pay off all of the loans … over that short period who knows what investment returns will be? And, there is something to be said for being debt free … especially when it can happen so quickly! On the other hand, if Bristol has a plan to make an immediate investment (found a great business to buy or invest in; found a great real-estate investment; has a brilliant idea for anew business; and so on) then why hold off on ‘the big payoff’ to pay down circa 5% debt, instead? Who cares about your debt at this time! What do you want to do with your life? Bristol’s current life plan – not what to do with his debt – is the problem … because his current life plan is impossible! I do have a stable job where I invest in the 401k up to the match% only. I have $10000 in a savings [account] and $10000 in a few blue chip stocks. I would be willing to invest the majority of my savings. I am currently 23years old and would like to retire at least by age 55. So that would be 2066 and per cnn retirement calculator i would need 5.9million dollars (2.2million in todays dollars) to spend retirement happily. I think i could reasonably get 8% return. I think I would mostly like to invest in the stock market. I have been plugging my numbers into a similar calculator one that takes into consideration additional monthy contributions and have realized that if I want to reach my goal I will have to be much more aggresive. Although it is possible for me to get there, its just not happening on 8%. 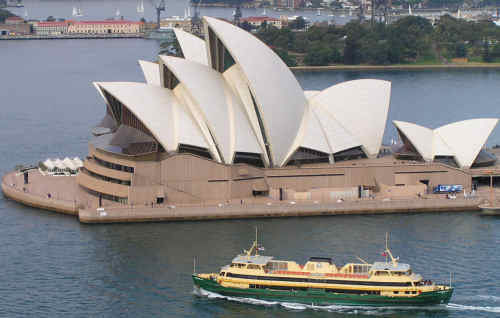 So I have alot of thinking to do about how to get there and how much risk Im willing to take. One thing is for sure, time is money and I will not be putting extra money onto the school loans anymore! Inflation forces very large Numbers for even relatively modest retirements: <$90k p.a. in today’s dollars (Bristol’s approx. target, based on a 4% ‘safe’ withdrawal rate on his $2.2 mill. pre-inflation target) may be considered luxurious by many, but – be honest – would you be happy working hard and being financially disciplined for 30 years and retiring on less? So, inflated (at a relatively modest 3% inflation rate) an ‘easy’ target like $90k a year (today’s dollars) requires you to save nearly $6 million over your working life; simple logic tells you that this is impossible for a normal working person … Bristol included. Bristol’s problem isn’t how to pay his debt; it’s how to amass at least $6 million in 30 years! Personal finance in America is broken; the advice is small picture (pay debt, live frugally). Who’s there to give the Bristol’s of this world the big picture? It may seem trivial, but just getting this down with the absolute minimum of lines, and icons (representing our features and benefits etc.) was very difficult but absolutely key. We changed our business model a number of times (esp. around how we charge for our services) through this exercise! Hint: If you find a model here that’s fairly similar to what you have in mind, then modifying it is a great way to jump-start the process! If you want to give this a try, and I recommend it, start by downloading the free powerpoint template from the Board Of Innovation’s website here. Even when this idea is explained to people, most refuse to accept it. Statman suggests that it comes down to a cognitive bias called mental accounting. Investors categorize $1,000 in dividends as income that they will happily spend, but the idea of selling $1,000 worth of stock is “dipping into capital,” which causes them great anxiety. This idea is deeply ingrained in many investors, but it is an illusion, because a company that pays a dividend to shareholders is depleting its own capital. If you want to understand the arguments – both for and against – investing in so-called ‘dividend stocks’ for the sake of the dividends, you would do well to read Canadian Couch Potato’s whole blog post AND the comments … all for/against arguments are well thought out. – They could buy more inventory: if their business is a volume business, more inventory = more profits. Consumer products companies such as Kraft and Unilever are great examples. – They could do more R&D: investing in R&D is necessary gambling on the future; often it will be money wasted (in which case it’s better off in your pocket as a dividend), but sometimes it will provide a huge payback, such as when a pharmaceutical company develops a breakthrough medication, or a venture capital firm finds the next FaceBook. – They could invest in marketing: more marketing = more sales; pretty simply, huh? Consumer products and technology companies are classic examples; the more often they put their products in front of the consumer, the more sales they seem to get. – They could invest in more infrastructure: more factories, more locations = more revenue and more profits. 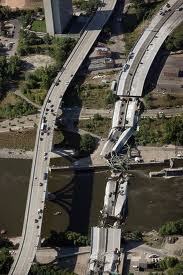 Manufacturing companies, high tech businesses, and retailers are all tied to physical infrastructure. – They could invest the cash – Many companies (think Microsoft, Apple, the tobacco companies, and the brewers) are sitting on a ton of cash. Heck, Berkshire Hathaway is sitting on so much of it, even Warren toys from time to time with giving it back to the shareholders (i.e. 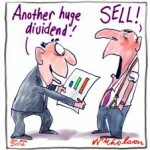 by issuing a dividend); after all, if they can only get 3% while it’s sitting in the bank and you can get …? Inevitably, though, they use this cash to make a spectacular purchase that transforms the company: think Google’s $6.5 billion offer for Groupon, or Berkshire Hathaway’s $44 billion purchase of BNSF Railway. – You could buy more stock in the same company: this is the basis of the automatic ‘dividend reinvestment policy’ that most companies now offer. So, let me see … you invest in company ABC because it issues a dividend, and you use it to, what? Oh, buy more stock in company ABC?! – You could buy more stock in another company: why invest in another company? Oh, because it provides a better return. So, why not pull ALL of your money from the worse-performing dividend paying stock, and put it all in this company? – You could buy more stock in a bunch of companies: diversification is often seen as a good thing [AJC: by many reading “how I became rich” blogs; rarely by those writing them]. The more you diversify, the more you tend towards average market returns. Why would you want to take your cash out of a company that produces spectacular returns [AJC: that’s why you invested in the ‘dividend stock’ in the first place, isn’t it?!] in order to put your money into something that produces average returns? – You could keep your cash in the bank: strangely enough, this one makes sense; if the company can’t do anything better with their ‘spare cash’ than give it to you, wouldn’t you rather have it sitting in your bank account rather than theirs, so that you can at least have the flexibility to make the decision what to do next, eg leave it in the bank, buy some index funds, pay down debt, or even buy back into the company stock when they get out of the ‘sit on a ton of cash with no vision for the future’ doldrums. … but, if any of these things are better than leaving the money in the company, wouldn’t you be better off taking all of your money out of the company all in one go (i.e. sell the stock) rather than in dribs and drabs (i.e. taking small dividends)? Warren Buffett got started by purchasing a textile company and immediately canceling it’s dividends! So that he would have more money to invest in growing the company. Potential investors who wanted dividends invested elsewhere … those who didn’t invested in Berkshire Hathaway and became multi-millionaires! Berkshire Hathaway still operates on the same principle: why pull money out of BH when Warren can grow your money faster?! I am in love with your debt cascade idea, I was stuck in an internal conflict about paying off debt or investing for years until now. I would like to apply your debt cascade to my financial situation and need your help. I have an extra $2000.00 after minimum payments per month that I dont know what to do with. What amount would you put on these loans and what amount would you invest? Help me help a reader; what advice would you give?